The data acquisition system for temperature measurement with 8 thermocouple inputs TC-08 is designed to measure a wide range of temperatures using any thermocouple that terminates in a miniature size thermocouple plug. 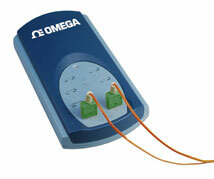 Additionally the TC-08 can also measure other sensors using a ±70 mV range. Featuring built-in cold junction compensation (CJC), the TC-08 has an effective measuring range of -270 to 1820°C (the actual temperature range depends on the thermocouple type being used). Included with the TC-08 is powerful but flexible data acquisition program designed for collecting, analyzing and displaying data, which can be viewed both during and after data collection in spreadsheet or graphical format. If required, the data can also be easily exported to other applications. You can configure multiple (USB) TC-08s, set the sampling interval from 0.1 seconds to several hours and set the maximum number of readings. You can also set what you want to do once the thermocouple readings have been taken - either: Stop; Repeat Immediately (start again); Scroll (oldest recordings disappear); or Repeat After Delay (where the delay is set by the user). For users who wish to develop their own software, we provide, free of charge a range of software drivers and examples. Drivers are included for Windows XP (SP3), Windows Vista, Windows 7, Windows 8 (not Windows RT) and Windows 10 (32 and 64 bit). The SDK supports all C-compatible languages, and programming examples are supplied for C, Visual Basic for Applications (Microsoft Excel) and National Instruments LabVIEW. Note: Includes Windows software and drivers, USB cable, printed quick start guide and complete operator’s manual on CD.